The embodiment of this neoconservative modus operandi, however, has not been small-circulation magazines, but the proliferation of so-called “letterhead organizations”—committees of eminent persons who, though they never actually meet to discuss issues, sign their names to letters addressed to the powers that be, often sitting U.S. presidents. That such letters could make splashes in the elite media is a reflection of the way neoconservatives have embedded themselves in the Washington establishment—their opinions mattered and, most importantly, sometimes ended up becoming policy. Indeed, one of the best-known neocon letterhead groups, the Project for a New American Century (PNAC), led by Bill Kristol, helped launch the campaign for militarily removing Saddam Hussein from power with a 1998 letter to then-President Bill Clinton. The letter garnered only 18 signatories, but within five years, and under a new president, it had achieved its goal. The new expansion of neoconservatives’ messaging reflects shifts in both the personnel and personalities of neocon groups and publications—younger neocons tend to be bloggers or public relations specialists, not intellectuals (or pseudo-intellectuals)—as well as the changing landscape of U.S. political support for policies that neocons espouse, most notably, a far-right Likudnik take on Israel and its relationship to the United States. Support for right-wing Israeli policies is slipping from its demographic foundation, the otherwise-liberal American Jewish Zionists. This development was highlighted by Peter Beinart in a June 2010 essay for the New York Review of Books, “The Failure of the American Jewish Establishment.” The provocatively titled article questioned whether unstinting support for figures like Israel’s über-nationalist foreign minister Avigdor Lieberman turn off rank-and-file liberal American Jews from the Zionist project and, therefore, Israel. The trend appears to be especially prevalent among young American Jews—a point that surely has set off alarms in the “Israel Lobby” as attendees at conferences grow grayer year after year. As a result, neocons and other Likudniks in the United States are increasingly turning to those who will uncritically support their policies. Disdain for Palestinian aspirations (and, apparently, Muslims in general) coupled with the aging of the old guard has spurred neocons to turn to the country’s ever-swelling ranks of Christian Zionists, who represent tens of millions of voters. 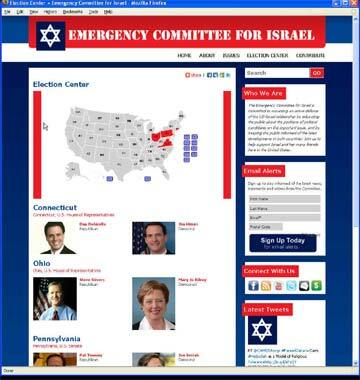 This past July, Bill Kristol, Christian Zionist heavyweight Gary Bauer, a handful of right-wing luminaries and up-and-comers formed the Emergency Committee for Israel (ECI). Rather than drafting letters in policy-speak to advocate directly to the president (as Kristol had done with PNAC), ECI produces ad campaigns in local congressional races, publishing fear-mongering adverts on YouTube and local TV slots, which are quickly disseminated through right-wing channels. But like their predecessors, these new groups have little or no grassroots support—meaningful participation is limited to board members, a few advisers, and staff—qualifying them as archetypal astroturf organizations. ECI launched with a 30-second television commercial targeting Rep. Joe Sestak (D-PA), a Senate candidate, for being insufficiently pro-Israel. The commercial—which began to on July 13 in the Philadelphia area on CNN, FOX, and during two baseball games—claimed that Sestak helped fundraise for the Council on American-Islamic Relations (CAIR), a charge he has denied, and signed a letter accusing Israel of participating in “collective punishment” in its blockade of Gaza. It seems that ECI was attacking Sestak for being too supportive of the Barack Obama administration’s Middle East policy and for receiving campaign contributions from a progressive Zionist group—the self-proclaimed “Pro-Israel, Pro-Peace” organization J Street PAC. Indeed, the attacks were so aggressive and baseless that many observers questioned whether the commercial was even targeted at Jewish voters in Pennsylvania. “The target audience is not really Jewish voters in Philadelphia and its suburbs—they tend to be a reliable Democratic constituency and an important source of campaign donations. Rather, the ad is aimed more at mobilizing the right and evangelicals in support of Mr. Sestak’s Republican opponent, former Representative Pat Toomey,” wrote Seelye. The television ads certainly played a role in calling attention to ECI and its attack on Sestak. But the ad’s launch on YouTube, on the same day that ECI’s website went live and their doors opened for business, also says a lot about how neoconservative letterhead organizations operate in the age of the internet. The cyber battle ground has been a major recent focus of neocons and other groups affiliated with the Israel Lobby, possibly because of the gains of J Street, which promotes more robust U.S. pressure in the peace process. J Street has a strong presence on the internet, with a sleek website that seems aimed at young American Jews disillusioned with the rightward stance of many of the groups that comprise the lobby. Indeed, all the candidates attacked by ECI have either been endorsed by J Street’s political action committee or signed letters along with J Street. Kristol even took a thinly veiled swipe at J Street when discussing the launch of ECI with Politico’s Ben Smith, describing his new group as “the pro-Israel wing of the pro-Israel community,” a play on J Street’s “Pro-Israel, Pro-Peace” slogan. By premiering its commercials on YouTube, ECI enables right-wing blogs and mainstream news outlets to embed the short clip on their websites and discuss the emergence of the new group and its mission to attack insufficiently pro-Israel candidates. In a very noticeable trend, ECI’s videos—there have been four to date, attacking Sestak, Ohio Rep. Mary Jo Kilroy, Virginia Rep. Glenn Nye, and, most recently, Connecticut Rep. Jim Himes—have all been publicly announced and received early promotion on the blog of the Weekly Standard. With their long track record of elite-focused organizing—a trend dating back to the 1970s-era Committee on the Present Danger—the neoconservatives’ shift to more tech-savvy public relations campaigns seems to be a calculated decision. Nowhere has this new approach been more evident than in Kristol and Bauer’s decision to select an up-and-coming neoconservative, Noah Pollak, to be the group’s executive director. Pollak was a surprising choice given that former political appointees or other high profile individuals with established credentials and connections to policymakers have headed up other recent neoconservative letterhead groups, such as the Foreign Policy Initiative or PNAC. Pollak represented a sharp change in direction: Rather than being an intellectual or eminent D.C. character making a foray into journalism and advocacy, Pollack is a journalist-turned-activist who has no intellectual or high-profile government accomplishments to speak of. Other neocons seemed to appreciate the shift: Former George W. Bush speechwriter David Frum said, of ECI, that “the real news is the group's director: Noah Pollak, a friend of mine, and a brilliant advocate for rethinking Israel's self-defense in a new media era.” It’s notable that Frum did not tout any book by Pollak (he has none, while many of his elder ideological comrades are prolific authors) or even any grand strategic idea beyond a public relations scheme based on updating nineteenth century Prussian military theorist Carl von Clausewitz’s clichéd assertion that war is a “political relations… by other means.” Frum cited Pollak’s contribution to the Israel Defense Force’s (IDF) effort in Gaza in the winter of 2008 and 2009, crediting Pollack with the initial idea behind the IDF YouTube channel. The channel was a vital tool for Israeli public diplomacy after the May 2010 Israeli naval raid on the Mavi Marmara. After graduating from the University of Vermont in 2003, Pollak launched a career working for numerous neoconservative publications, including Azure, an Israeli magazine published by the Likudist Shalem Center (which also launched a think tank funded by rightwing billionaire Sheldon Adelson); Commentary, a flagship of the neocon movement where Pollak wrote both for the print edition and the “Contentions” blog; and Middle East Quarterly, the journal of Daniel Pipes’s Middle East Forum, where Pollak was an assistant editor. Pollak’s resume hints at another characteristic of these cyber-savvy versions of letterhead organizations: Their staffs are not much different from their earlier incarnations. Indeed, as Frum says, the significant point is not that Kristol and Bauer hired Pollak, who is obviously a dyed-in-the-wool neoconservative, but that they made him director of the group. Neoconservatives are relatively few in numbers, so the pool of potential employees was never large—it’s Pollak’s position that’s news. In an earlier era, the blogger among the book authors would have a less celebrated position in the letterhead group—former Weekly Standardblogger and online editor Michael Goldfarb was a mere research assistant during his early-career stint with PNAC. These days, as a senior vice president of Orion Strategies, Goldfarb is advising ECI as well as other new-school letterhead groups, such as the Kristol-Liz Cheney founded Keep America Safe. Like ECI, Keep America Safe makes short internet videos and television commercials attacking Obama’s policies in the Middle East and in the so-called “war on terror,” drawing on familiar supporters like Mel Sembler, a Republican party donor and financial benefactor of the American Enterprise Institute and the Adelson-funded Freedom’s Watch. But the web of neoconservative connections at ECI doesn’t stop there: in addition to Bauer and Kristol, the third member of the group’s board is Rachel Abrams, daughter of Midge Decter, step-daughter of neocon patriarch Norman Podhoretz (therefore step-brother of Commentaryeditor John Podhoretz), and wife of arch-neoconservative hardliner and former George W. Bush administration official Elliott Abrams. But the revelation does demonstrate, as Elliot pointed out, “just how small a world the still-influential neocon foreign policy community occupies.” Goldfarb’s employer Orion, for instance, is the lobbying outfit of Randy Scheunemann, a top foreign policy adviser to Bob Dole’s and both of John McCain’s presidential runs, and the former director of both PNAC and CLI. Most recently, Bauer launched his own letterhead/attack-ad organization, Keep Israel Safe, with Weekly Standardcontributing editor Tom Rose. They modeled the group on Cheney’s Keep America Safe (right down to the name) and, as one might expect, the Weekly Standardwas instrumental in the group’s launch, getting an exclusive by “obtain[ing] an advance copy” of the first attack ad on Obama even before the group’s website was up. Keep Israel Safe has since released two more videos distorting Obama’s record and condemning his approach to Middle East peace. Keep Israel Safe’s namesake—Cheney’s Keep America Safe—also focuses on internet videos, creating four original videos since its launch last year. 2009 tax filings from Keep America Safe reveal just how cheap it is to produce these internet videos: while the group raised nearly half a million dollars and spent only a quarter of that, the four videos cost only $12,154 to produce – that’s just over $3,000 per video. No wonder, then, with the price tag of these videos so low and distribution costs at zero, that the YouTube advertisement has proliferated among advocates of hardline militarist policies. Another group that has produced a short internet video is Stop Iran Now, which focuses less on Israel and more on the other neocon obsession du jour—promoting the idea of a military attack on Iran. Naturally, this ad, too, was run on the Weekly Standard’s blog. Like Keep Israel Safe, Stop Iran Now’s website is only a video portal and a space to sign a petition against Obama. As Salon’s Elliot noted, making internet videos updates perfectly the old model of letterhead organizations with a “low-budget, high-impact model that was used so successfully by the Committee for the Liberation of Iraq. It's a model that involves a very small staff and physical footprint coupled with the ability to get lots of free coverage from a hungry political media.” Indeed, whenever a member of one of the groups behind the videos shows up on a cable news show, the short clips tend to be aired in full. The zeal with which the right-wing promotes the videos may point to growing desperation. While neoconservatives have made gains—for instance, in their campaign for escalating measures against Iran—the operative consensus in Washington seems to be that Obama is not yet ready to carry out the hawks’ ultimate goal of bombing the Islamic Republic. Their efforts to keep the U.S. public uncritically supportive of Israel is in even more dire straights. Beinart’s article is emblematic of a rising consciousness about the Israeli-Palestinian conflict in the United States. While the Weekly Standardpredictably takes a hard line, a growing number of outlets and blogs have arrived at more nuanced editorial positions about the transgressions of the Jewish State. Take Andrew Sullivan who, like Beinart, is a one-time editor of the New Republic, a liberal magazine with a neoconservative foreign policy. Sullivan’s popular Daily Dish blog now routinely runs items critical of Israel’s expansionist streak (a prominent feature of the Likud party), policies in the Occupied Territories, and—most notably—Israeli intransigence in the peace process (not to mention neoconservative promotion and complicity in these and other hardline notions). Even the New York Times, which since the early 1970s has espoused what many critics charge is an Israel-centric bias, runs items critical of Israel both occasionally in the newspaper and more regularly on its blogs, such as Robert Mackey’s the Lede blog. Recent shifts in both public discourse and the political leanings of the country have made positions taken by neoconservatives increasingly untenable. The invasion of Iraq has become something of an albatross around the necks of those who lobbied for it, and the failure to find the promised weapons of mass destruction has seriously tainted those hawks who promised that Saddam Hussein was developing stockpiles of chemical, biological, and possible nuclear weapons. The neocons, while retaining their perches in the media and some think tanks, are largely discredited—especially given the current occupant of the White House. The election of Barack Obama in 2008 has left the neoconservative community in Washington increasingly isolated from policy elites. Obama’s stated willingness to meet with leaders like Hugo Chavez and Mahmoud Ahmadinejad, his emphasis on repairing the U.S. image in the Middle East, and his preferences for dialogue over bombastic rhetoric have put neocons and their allies on the defensive. Where Democrats are concerned, Bill Clinton’s liberal interventionist foreign policy was more susceptible to the overtures of moralistic pleas from neocons than is Obama’s calculating realist-heavy approach. Thus, it was logical that neoconservative activists would turn to a populist strategy of engaging congressional races, promoting “security” issues in local political campaigns, and reaffirming their movement’s ties with the Christian right—a far larger voting bloc than the Jewish, right-wing pro-Israel constituency. But while the lowering costs of technology have given Bill Kristol, Gary Bauer, Liz Cheney, and their fellow travelers an ability to speak directly to the U.S. public, serious questions should be asked about how successful their movement can be as they shift from elite-centered advocacy to populist messaging focused on Christian Zionists and the Tea Party Movement—a movement which Bill Kristol has suggested is comprised of the “pro-American wing” of the U.S. public. While neoconservative influence on the young Tea Party movement is up for debate, it’s clear that the new outraged populists do owe something to neocons—it was Kristol, after all, who discovered Tea Party darling Sarah Palin during a Weekly StandardAlaskan cruise in 2007. But perhaps more telling are the sagging public approval numbers for the ongoing war in Afghanistan. According to a recent Gallup/USA Today poll, 43 percent of respondents thought it was a mistake to go to war in Afghanistan after the 9/11 attacks. This marks a dramatic drop from the 93 percent of Americans who supported U.S. military action in Afghanistan in November 2001. The public’s taste for war and a militarized foreign policy is quickly fading. War fatigue, the changing demographics of the Israel Lobby, and new political realities in the United States are forcing hawks to reinvent their advocacy methods. The movement has fallen far, but with allies on the populist fringe of U.S. politics, the neoconservatives seem to have found fertile ground for their fear-mongering messages, which could have profound repercussions in the months and years to come. While the switch from elites to grassroots represents a sort of demotion for those men and women who used to have the ears of diplomats, presidents, and cabinet members, they are nonetheless achieving a level of recognition and acceptance in the mainstream which the elder generation—not the least of them Irving Kristol—would have found hard to imagine. To see William Kristol make his weekly appearances on Fox News or Noah Pollak head up the ECI’s ad campaign in congressional races, it’s hard to miss the obvious irony. While suffering losses in their influence over policy elites in Washington, the neoconservatives have become an ingrained and accepted component of the American right-wing. And while Clinton was easier to pressure, it took the unstinting support of President Bush for the neoconservatives see their goals in Iraq fulfilled. In the post-Obama era, which may arrive sooner than many expect, it is frightening to contemplate what sort of policies the next president—propped up by Christian Zionist zealots—will pursue vis-à-vis the United States’ engagement with the world. Ali Gharib and Eli Clifton are independent journalists who write for the Inter Press Service blog Lobelog (http://www.lobelog.com/) and are contributors to Right Web (https://rightweb.irc-online.org/).